We know how to check iOS firmware based on iPhone model in the previous content already. Now refer to your model number of your iPad, you will be able to identify which iOS firmware file you need to download. 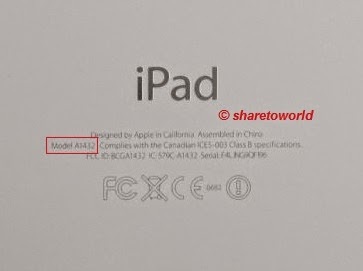 You can find the model number on the iPad's back cover. Find out the table below to determine the identifier for your iPad, so you can figure out which iOS firmware file to download. For example: You need to download iPad2,5_7.1.2_11D57_Restore.ipasw file for iPad Min Wi-Fi with model number A1432.